Roasted carrots tossed with fresh dill and spices makes an easy suitable for a variety of eating styles. Carrots are unsung vegetables. They can hang out in the crisper drawer for weeks before supporting soup stocks or transferring hummus into my face. They are one of the innocuous vegetables to encourage picky kids to eat. Rarely do they get a moment in the spotlight. A few years ago I noticed I'd amassed a bunch of bags of carrots from the Community Supported Agriculture (CSA) farm share, so I celebrated HashtagCarrotWeek and shared a variety of recipes using carrots (breakfast through dinner). 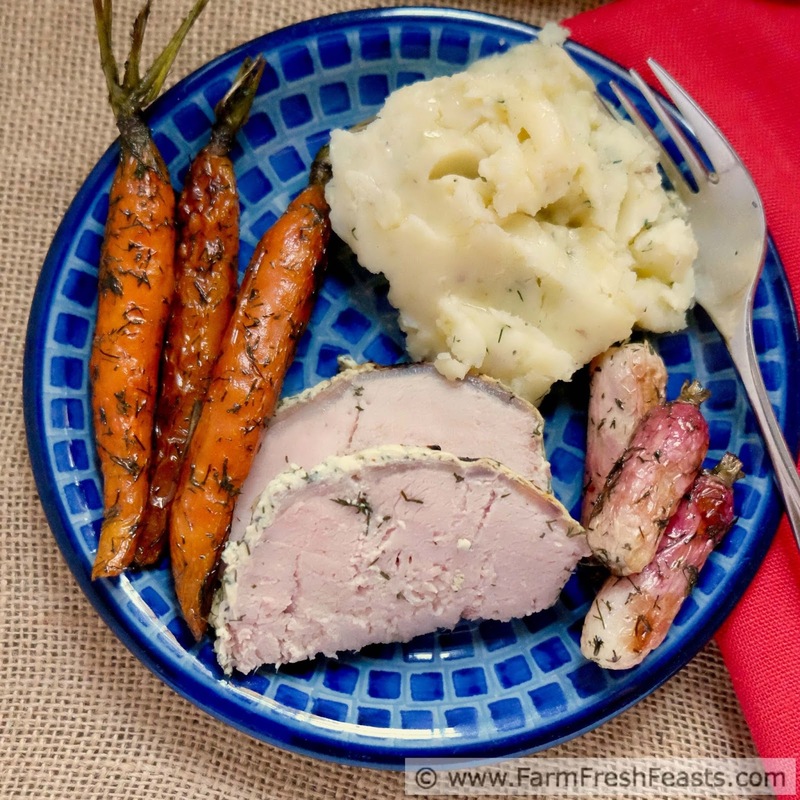 When I got a particularly uniform group of carrots from the farm share, along with yet another bunch of fresh dill, I decided to combine the two in a roasted side dish. 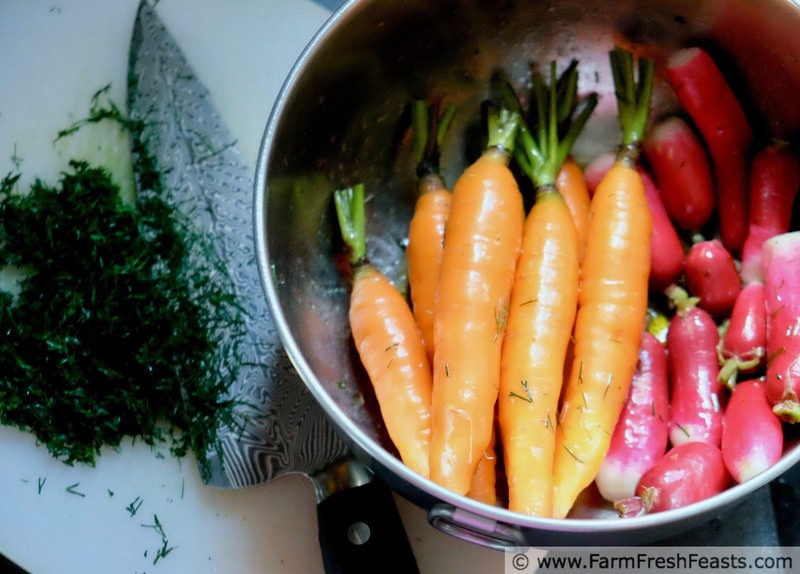 Ok, truthfully I tossed in some French breakfast radishes to the roasting pan as well, but this post is about the carrots because they really shined with this treatment. My dad is getting more out of the weekly bunches of radishes, eaten on buttered bread, so I'll leave those to him. I think these carrots would be a terrific holiday side dish. Since I used olive oil they are vegan, and would be useful if you need a side dish for a crowd of eaters of varying styles. I served mine with roast pork covered in a yogurt/mustard/dill sauce, a quickie version of my Make Ahead Mashed Potato Casserole (with fresh dill added) and the dill on dill action worked nicely. Stay tuned for the pork recipe--it's coming up next month! 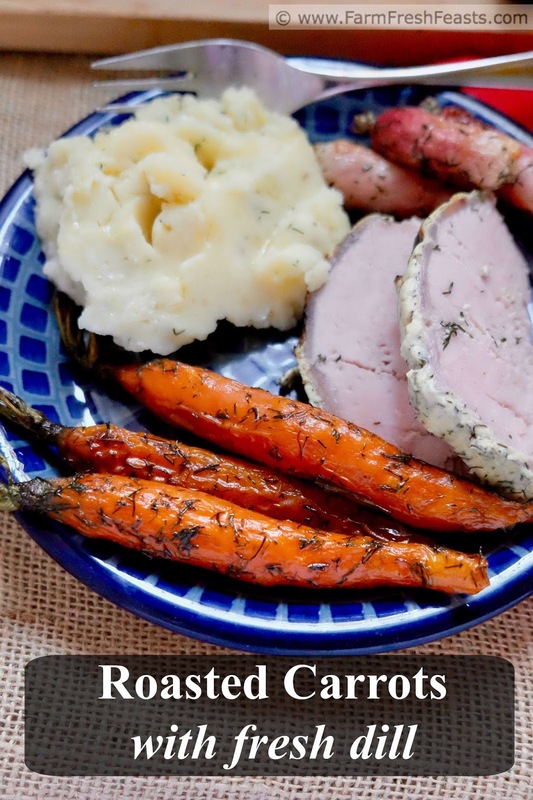 For more recipes using carrots, please see my Carrot Recipes Collection. For more recipes using herbs, for when you're overrun with fresh herbs, please see my Recipes Using Herbs Collection. These collections are part of the Visual Recipe Index by Ingredient, a resource for folks like me eating from the farm share, the farmer's market, the garden, the neighbor's garden, and great deals on ugly produce at the grocery store. Preheat oven to 375 degrees Fahrenheit. If you're roasting these carrots alongside an entree cooking at 350 degrees, cook them a bit longer. If you're roasting these carrots alongside an entree cooking at 400 degrees, check them a bit earlier. In a large bowl, toss carrots with olive oil and dill. Spread on a rimmed baking sheet. Sprinkle with salt and pepper. Place baking sheet in oven and set the timer for 15 to 20 minutes. Shake the sheet to turn the carrots, and return to the oven for another 10 to 15 minutes. Depending on how thick your carrots are, you may need to return the carrots to the oven for another 10 minutes or so. 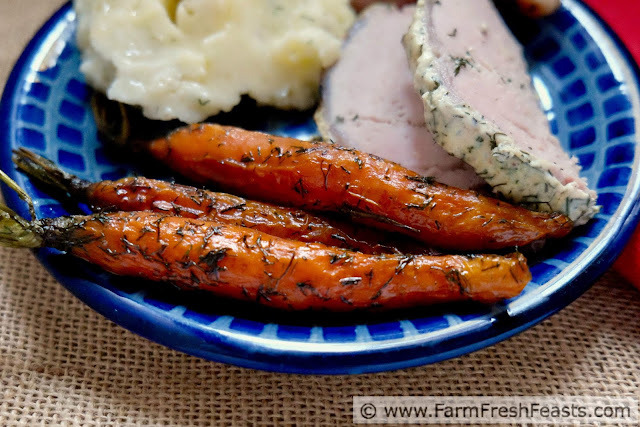 Roast until the carrots are tender and lightly browned in spots. Serve warm. Your carrots go the same way mine do (soups and hummus scoopers) although I do love the idea of roasting them as is. I keep meaning to try something like this.